Our practice uses CoolAdvantage Applicators, the most up-to-date CoolSculpting applicators available. (Not every clinic does). The new design of CoolAdvantage applicators reduces treatment time by nearly a half, improves patient comfort and treats a larger cooling area. CoolAdvantage applicators are offered in many different sizes and shapes. Our full kit of CoolAdvantage applicators literally gives us the tools to serve every body. We take great pride in achieving your most desirable outcome and we truly care about your end result. With the new CoolAdvantage applicators we are able to freeze fat from multiple body areas at once, achieve optimal placement and customize treatments to your individual body. We use the COOLMAX applicator to treat larger areas of fat. This applicator de-bulks the lower and upper abdomen, as well as love handles around the hips. This is the largest applicator and very effective at treating large areas of fatty tissue. The COOLCORE ADVANTAGE applicator is our most popular applicator. 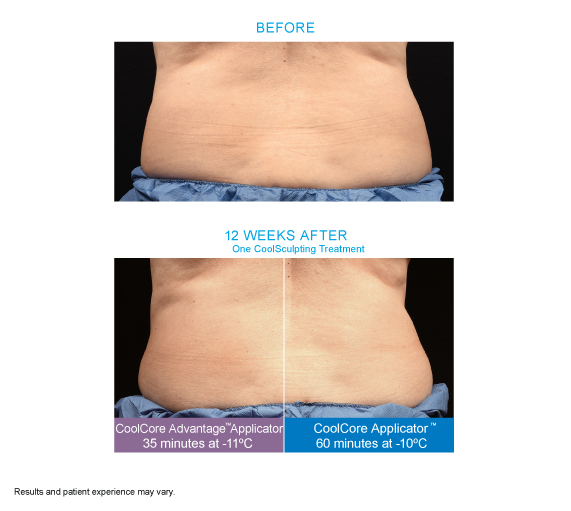 The COOLCORE ADVANTAGE is perfect for medium-sized areas of stubborn fat, like the stomach and bra line. We also use the COOLCORE ADVANTAGE following the COOLMAX to achieve the most desirable sculpting. The COOLCURVE+ ADVANTAGE applicator is very effective treating stubborn fat on smaller people with a narrower build. This applicator is shaped to curve around the side of the abdomen, bra line and other curved body areas. The COOLSMOOTH PRO has revolutionized body sculpting. Unlike other applicators, the COOLSMOOTH PRO is not a suction applicator. The COOLSMOOTH PRO lays on the surface of the skin and is used to treat body areas that do not need to be sucked in. This applicator therefore makes it possible to treat fat on the entire body. Popular treatment areas include the outer thighs, saddlebags and the sides of the stomach. The COOLFIT ADVANTAGE applicator targets longer bulges of fatty areas, such as the arms and the inner thighs. Creating a gap between the inner thighs is a very popular treatment and the COOLFIT ADVANTAGE is perfect for such applications. 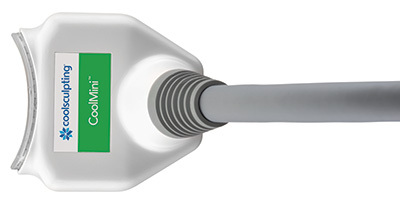 This applicator is usually used in a series. See the below before and after photo. Do you see the improved results when using the CoolAdvantage applicators? This is why CoolAdvantage applicators are a ‘must have’! We are a premier Denver CoolSculpting Certified Practice. We offer affordable and cost effective CoolSculpting treatments with an upfront pricing policy.